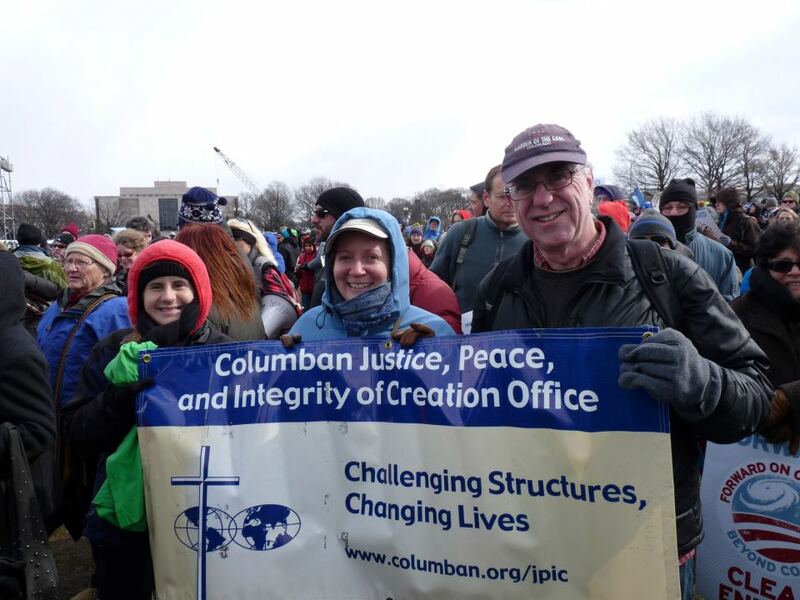 Sub-zero temperatures could not keep tens of thousands of people (an estimated 50,000) at home on Sunday, February 17, 2013 for a historic rally on climate change in Washington, D.C., The Columban Center for Advocacy and Outreach (CCAO) was no exception. On the first Sunday in Lent Columbans were Presente! with current and former CCAO team members waving the Columban JPIC flag as we stood in solidarity with Creation and all communities that suffer due to climate change. I was struck by a number of things over the course of the rally. First, as we began the Lenten journey, I was reminded of the importance of public witness as an expression of our faith. There is no greater radical public witness than Jesus’ journey from the gates of Jerusalem to the Cross. He chose the garden, the streets, and Golgotha, to make known to humanity his faithfulness and love. As I stood on the national Mall in the shadows of the White House and Capitol Hill, I was reminded of Jesus’ words to Caiaphas, “I have spoken publicly to the world. In secret I have said nothing.” (Jn 18:20). Jesus, rejected to the point of death, looked the nay-sayers of his day in the eyes. He faced them with compassion, unwavering in his love for all people, knowing that his message was not understood or accepted by the powerful and wealthy elite. Joining thousands on the chilly Sunday afternoon also struck home for me the importance of communion. Having named Called to Communion as our guiding vision for the next six years at the recent General Assembly of Columban missionaries, this rally reminded me what true communion looks and feels like. It can be uncomfortable, tiring, even painful, but in our Catholic tradition, the Eucharist is not symbolic gesture, but a transformation of bread and wine into the Body and Blood of Christ. So too we are transformed in real and concrete ways when we enter into relationships that move us out of our comfort zone. As Columban Fr. Naill O’Brien describes, “[Eucharist], is nothing less than an act of revolution, a radical call for personal and social transformation; it challenges every unjust structure and calls to offer our lives in the struggle to change these structures.” (N.O’Brien. Island of Tears, Island of Hope). Understanding Communion in this way gives new meaning and challenge to the Real Presence of God in the Eucharist and in our lives. We are invited and encouraged to be participants in the transformation we seek. Mystic and saint, Teresa of Avila calls us to become God’s hands and feet, eyes and hearts in the world. I would have much preferred to comfortably watch the rally on TV from my warm living room, but my faith impelled me to join the crowds and shout for environmentally sound policies until my throat was raw. Hands and feet, voice and vision, Columban missionaries have for decades worked to challenge structures and change lives. Often met with rejection, Columbans have remained faithful to JPIC as an integral part to preaching the Gospel and mission. During our 2006 General Assembly we identified climate change as one of our top two JPIC priorities. We affirmed this priority at the 2012 General Assembly and expanded it by making the connections between climate change, extractive industries, and water issues. This re-iteration comes as a result of seeing sea levels rising in Brazil and Fiji; glaciers melting along the Andean peaks in South America and in Pakistan; desertification and sandstorms in Korea and China, to name a few. While some people continue to question the realness of climate change; our missionary experience tells us in the communion we live with that Creation and communities are increasingly vulnerable as a result of human over-consumption.